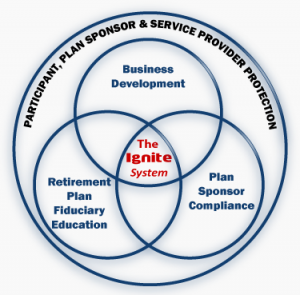 Ignite Fiduciary Sales System - OTB Strategic Consulting, Inc.
Plan Sponsors know how to run their core business but who will educate them on running a retirement plan that is not their core business? They desperately need help, guidance and education to truly understand the extent and degree of their fiduciary duties. That’s where you come in - be the one to educate and guide them -- not your competitor. 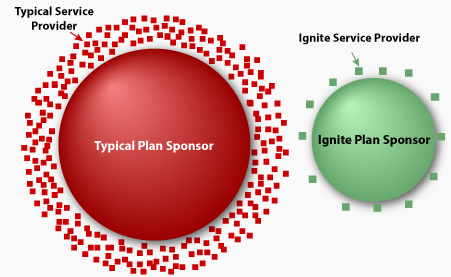 Ignite helps increase sales, retention and profit margins in the retirement plan area while reducing compliance issues. With fees and fiduciary issues in the press every day, this has become a large concern and there is a solution. Charts, templates, checklists and educational pieces that provides easy to understand guidance for all Plan Fiduciaries from the Board Rooms to the front lines to increase sales and client retention. Sales training, webinars, customization, and one-on-one advice. Identifies plan sponsor compliance issues that require attention and provides solutions. it also educates Plan Fiduciaries on their responsibilities based on their plan design and provides action items they need to implement and control. ERISA and non-ERISA retirement plan fiduciary duties have been un-complicated for you and your clients. The Ignite Fiduciary Sales Partner Program was created to help you grow all your business by creating better, stronger lasting relationships with your clients as their “trusted adviser.” Click here for more information including benefits of the program.